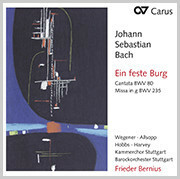 Despite their high musical qualities the Lutheran Masses, as they are known, are often overshadowed by other church works by Bach. 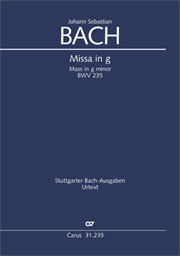 Like the other Missae breves, the Mass in G minor, with its six-movement structure, consists largely of parodies from cantatas BWV 72, 102, and 187. The extensive choral sections of the Kyrie, and particularly the lively Gloria, require a high level of engagement from all parts to achieve a thrilling and forward-driving effect. 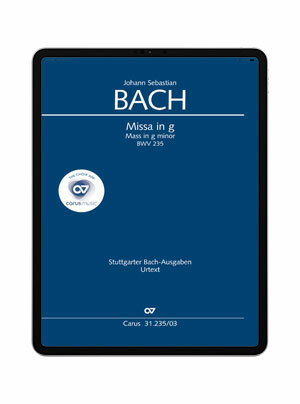 With Bach’s Missa in g BWV 235 the coach offers not only the notes, but also the sung part. The coach is based on individual recorded parts sung by the Kammerchor Stuttgart, making practising even more enjoyable! At home and out and about: Straight away your choral works will always be with you to practice! With carus music, the new choir app, you can follow the music while listening to a top-class recording on your smartphone or tablet, and easily practice your own choral part with the help of a coach. With carus music, your concert preparation will be easy and efficient to master – and fun!